Brass, Bronze, Chrome and Stainless. 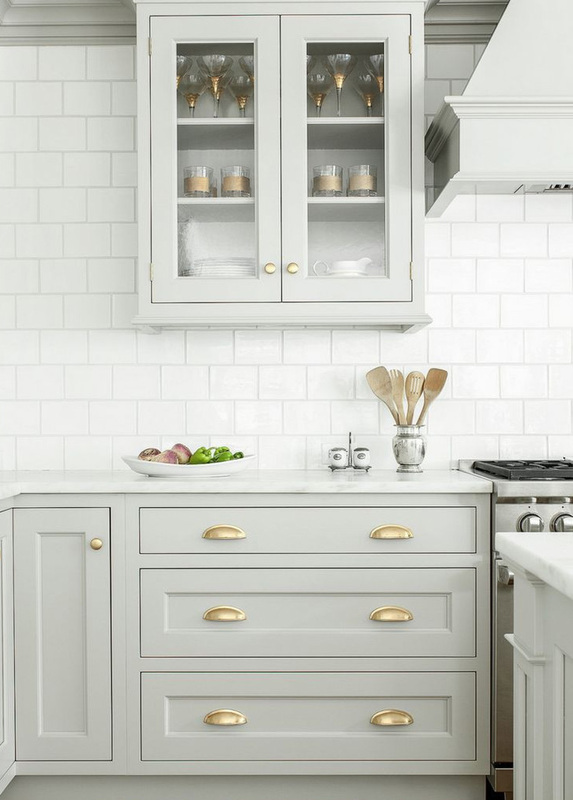 Everything You Need To Know About Cabinet Hardware. Cabinet hardware is available in countless finishes, but looks can be deceiving. Why is one cabinet knob thirty dollars and another three dollars? Here are the basics: Most hardware is made from inexpensive zinc or more expensive copper and brass. Often these base metals have a finish, or plating of a different color adhered to them. Stainless steel and bronze can be plated over these metals, but they can also be solid. Chrome and nickel are always plated over another metal, never solid. Confused yet? Well, most hardware is actually pretty durable and a cheap price does not always mean it's poorly crafted. Lets look at some of our favorite cabinet hardware finishes to compare the pros and cons of each material. Love these counters? Learn more about marble and seven other kitchen counter options. Polished Brass looks shiny and golden. It pairs great with painted cabinets. Pros: Polished Brass is sealed with a lacquer coating, so it will not age or tarnish. This common finish is easy to match between brands. Cons: Polished brass, like most shiny finishes, will show fingerprints and the lacquer can dull over time. 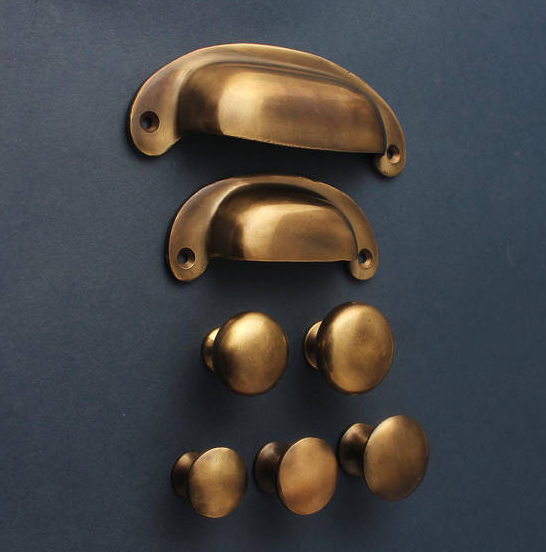 Unlacquered Brass is a living finish, meaning it will change with time and use. Pros: You don't have to worry about fingerprints here, unlacquered brass shows wear over time and the spots you touch will stay shiny. This raw brass has a warm, rosy color and you can always polish it back to a shine with brass cleaner. Cons: If you want a uniform look, unlacquered brass will take more maintenance. We prefer the worn patina on rounded, amorphous shapes. It can look dirty in an edgy, contemporary style kitchen. Antique Brass offers a patina without the maintenance. Pros: Antique brass is aged with chemicals and sealed with a low luster finish. This gives you a worn, antique look that will never change or need polishing. Cons: Chemically aging something never looks the same as a natural patina and the color here is not as warm as unlacquered brass. Bronze is highly durable and offers many finishes. Pros: Bronze is corrosion resistant and recommended for use in coastal homes with salty air. Many finishes and colors are available in bronze including the popular 'antique bronze', which looks black with copper highlights. Cons: Bronze is more porous than brass and can develop shrinkage cavities over time. Stainless Steel is the best choice for outdoor kitchens, but make sure it's solid. See more of our outdoor kitchens. Cons: Solid stainless is more expensive than other options. Plated stainless pieces are a good option indoors, but will not hold up outdoors. Make sure you know what you're buying when dealing with stainless. Chrome hardware adds drama and reflects light in this bathroom. Pros: Chrome gives a highly polished and reflective finish that you won't find in other metals. Chrome is corrosion resistant and looks great in polished bathrooms. Cons: While it won't rust, chrome will dull and develop pits over time. This shiny finish will also show fingerprints and water spots. Nickel looks soft, but also feels modern with a brushed finish. Check out the rest of this mediterranean kitchen. Pros: Nickel is available in brushed and polished finishes. It's color looks close to sterling silver and is warmer and richer than chrome. Polished nickel is easy to match between brands. Cons: Nickel is pricier than chrome. Unless it is lacquer sealed, this finish will tarnish and need maintaining. Matte Black hardware is contemporary, but we think it's a classic. There’s more black hardware in this colorful kitchen. Pros: Matte black is usually created by powder coating another metal. This process results in a very durable finish that won't show fingerprints. Similar to hand forged iron, we think this finish works great in older homes. Cons: Matte black hardware can look dramatic, especially against white cabinets. Use it sparingly and try to mix it with other metal finishes..